Written by Jane Wolford, O.D. Dry eye occurs when the quantity and/or quality of tears fails to keep the surface of the eye adequately lubricated. Dry eye affects millions of adults in the United States. The risk of developing dry eye increases with advancing age and women have a higher prevalence of dry eye compared with men. Dry eye causes a scratchy sensation or the feeling that something is in the eye. Other symptoms include stinging or burning, blurred vision, episodes of excess tearing that follow periods of dryness, discharge, pain, and redness in the eye. A middle (aqueous) layer contains the watery portion of tears and water-soluble proteins. 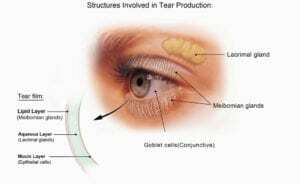 This layer is produced by the main lacrimal gland and accessory lacrimal glands. It nourishes the cornea and the conjunctiva, the mucous membrane that covers the entire front of the eye and the inside of the eyelids. 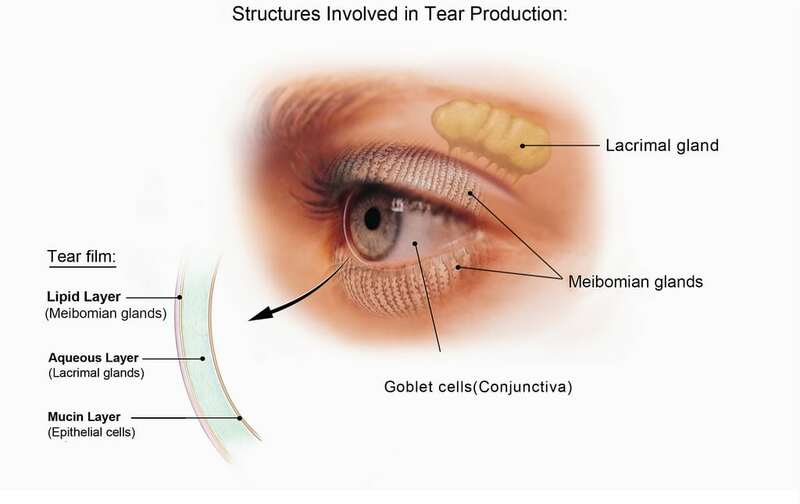 An inner (mucin) layer, produced by goblet cells, binds the aqueous layer to ensure that the eye remains wet. Medications: antihistamines, decongestants, antidepressants, birth control pills, hormone replacement therapy, medications for anxiety, Parkinson’s disease, and high blood pressure have been associated with dry eye. Advancing age as there is a decline in tear production. Dry eye is more common in people age 50 years or older. Autoimmune disorders: Sjögren’s syndrome, lupus, scleroderma, rheumatoid arthritis, diabetes, thyroid disorders, and Vitamin A deficiency are associated with dry eye. Women are more likely to develop dry eye. Hormonal changes during pregnancy and after menopause have been linked with dry eye as well as an increased risk for autoimmune disorders. People experiencing dry eye symptoms should schedule a dry eye consultation with our office to determine the cause, which guides treatment strategy. Smoking cessation and limiting exposure to secondhand smoke will help. Devices. FDA-approved devices provide temporary relief from dry eye by stimulating glands and nerves associated with tear production. Our office is pleased to be one of the first offices to be working with True Tears™. Surgical options. Punctal plugs made of silicone or collagen may be inserted by an eye care professional to partially or completely plug the tear ducts at the inner corners of the eye to keep tears from draining from the eye. In severe cases, in-office surgical closure of the drainage ducts. Dietary support including the addition of Omega 3 and the anti inflammatory Omega 6 supplements as well as decreasing processed foods.